I mentioned last week that we decided to put our house on the market. Well it went on the market last Thursday and by Thursday evening we had a contract. Complete craziness! Needless to say I have been in stress mode trying to find a house for our family. Not to mention the fact that I have to completely pack us for a move. In my attempts to make our load a little lighter, we have been eating out of our freezer and pantry quite a bit. I’m not sure our meals have been completely balanced, but I am seeing a dent in our cupboards and freezer. In all of the stress, I finally found an hour and decided to bake some zucchini bread. I have always said that to calm my soul I can spend time in the kitchen. (The ocean also works though there is no time for that now :). 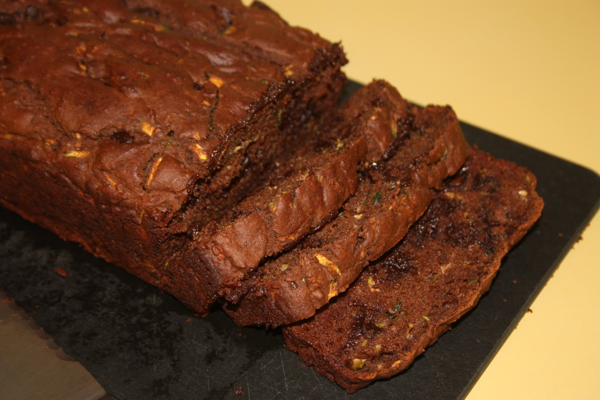 This zucchini bread is different from my previous chocolate zucchini bread in two ways. First, it is gluten free. Second, I also decided to try to go without processed sugar. What a huge step for me! I like the outcome and neither of my boys complained. Perhaps it is a good development. I can tell you that I won’t feel bad about having a slice for breakfast with my cup of coffee as I check out the latest home listings. Bake for 35-45 minutes until a toothpick inserted into the middle comes out clean. Let cool in pan 5 minutes before removing. Slice and enjoy! 2 Comments on "GF Chocolate Zucchini Bread"
Congratulations on your home! We just went through that very same scenario, except my husband was relocated to Florida!! It was the hardest move for our family, the stress was overwhelming and we hated to leave the home we built our future around. I still use your website often, and really enjoy following your recipes. Good luck with your new adventure. Thanks Karen! Hopefully once things get settled I will be a little more regular on my postings. Best of luck to you in Florida.